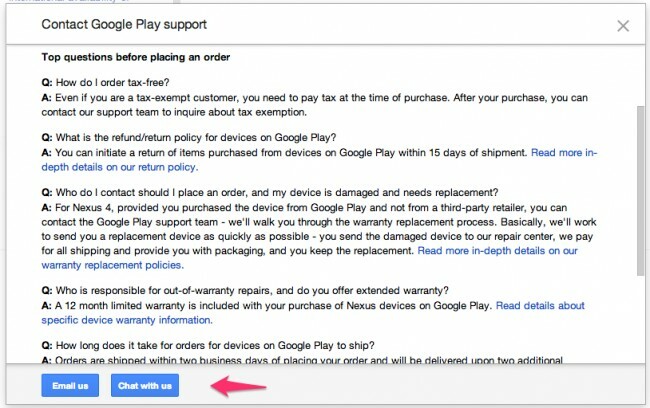 Did you know that Google Play Support now has a “Chat with us” option? In the past, if you needed support for issues through Google Play, you had two options: “Email us” or “Call us.” While these options certainly work, especially “Call us” since you can almost instantly get ahold of someone on the support staff over the phone by using it, some of us would rather use an online chat at times to take care of business. That’s now possible for select situations – those that involve device sales. 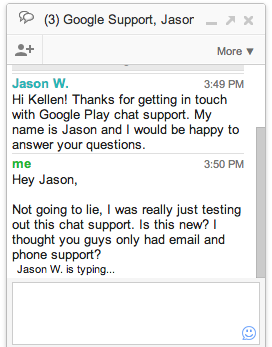 I tested the service out moments ago, finding myself in a Hangouts-like in-browser chat session with Google Support and a friendly tech named Jason. The nice thing about the chat was the fact that I didn’t even have to leave the Google Support page, because the Google Talk session started from within the same tab that I was using to find support. After asking Jason if the service was new, which he confirmed, I then let him get back to real customers and was able to close out my session. It was super simple. Also, the entire conversation is now listed as a chat session through my inbox, so should I need to go back and look at our conversation later, I can do that. I did see an option to go “off the record,” but in a support setting, I’m not sure why you would want to do that. As I mentioned earlier, this new chat support is only available for pre-sales of devices – in other words, you can’t get support for app sales, books, or movie returns. This is for hardware only. To access the “Chat with us” option, head into Google Play Support>Nexus help center and select a device, then Contact us, then “Buying devices…,” then “I have questions…,” and finally, the device you have questions about. You should see the button to start a live chat. If you are planning to buy a Nexus device in the near future and have questions, think about giving this new chat service a try.